In the last few months I’ve been involved in the care of three children with severe head injuries. Two were skateboarding and one was riding a bike at the time of the injury. All of their lives are forever changed. None was wearing a helmet. In all of these cases, and others that I’ve seen over the years, a helmet would have almost certainly minimized the severity of the injury sustained. There are already laws in place requiring helmet use in many states, including California. But, they are often not enforced. Kids should be wearing helmets when they roller blade, when they head to the skate park, when they go for a bike ride with friends. Today, my message is simple. We need to figure out how to make helmets cool. Start early. Children should be wearing helmets while riding on a parent’s bike, in a bike trailer, and when riding a tricycle. Make it the norm. We must wear our helmets too. Studies have shown that kids whose parents wear helmets are much more likely to wear their own. Talk to your teens. Many kids have helmets but choose not to wear them in certain situations. This seems to be particularly true when a child’s peers do not wear helmets. Ask your teen directly whether they actually wear their helmet. If they don’t, ask why. Discuss your concerns about injuries. Think outside the box. I would love to hear about initiatives at schools, college campuses, or cities that are working to increase helmet usage in their community. Helmet use is not a panacea for biking and skateboarding safety. Dedicated bike lanes and skate parks, and paying attention to the rules of the road also are important mitigators of injury. But, helmets are one of the best ways to minimize brain injury. We need a culture shift. We need helmets to be cool. Click here for more information on selecting and properly fitting a helmet. Have you talked to your kids about helmet use? How did you make it the norm in your family? Anyone working on novel safety initiatives with ideas to share? This entry was posted in Parenting, Safety and tagged bike helmets, bike safety, skateboarding by My Two Hats. Bookmark the permalink. Such a cool program, thanks for sharing. Wish there were sites in California. Will have to look into whether something similar exists here. I used to be very strict with helmets, especially with my first child, but I’ve become lax since #2 and #3 have started riding bikes and scooters. The biggest problem I have is that we typically don’t “go for a bike ride”, rather the kids will decide while they’re playing outside to get on their bikes/scooter/plasmacar and do a couple of laps up and down the driveway, before they’re off to something else. I’ve justified it by saying that a driveway on a quiet street is not high-risk, but am I deluding myself? Do you know of any studies on the breakdown of where head injuries occur, Heidi? Accidents are most likely to happen on busy city streets, especially in intersections. Bikers are safest when they are on bike designated areas (separate bike lanes, off-road bike paths, etc) and when there are a high number of other bikers around them. The organization Bikes Belong, has a section on safety statistics that provides a really good review of what is known on this topic. I haven’t found stats specific to where head injuries occur, but I suspect they follow these same patterns. Having said this, it’s still a good idea to wear the helmet all of the time. . . just in case (and to reinforce the habit). Maybe the helmets can hang on the handlebars and be ready for them when they decide to grab the bikes? In this, like so many things in parenting, it is tough to find the balance between safety and wanting to allow them the freedom to choose and explore. Thanks, as always, for your thoughtful comments. Best wishes in your new venture, Super Snacks for Super Kids! We are trying to set a good example for our toddler by always wearing our helmets while biking (a habit we formed as bicycle commuters in our previous lives) and making “helmet on” part of the routine when using her tricycle our our bike trailer. I do wonder about the teenage years, though. Yes, the teenage years are my biggest concern as well. With the little ones we can still pretty much guide them. For teens/young adults, wearing a helmet, like many things, is kind of up to them. And, given the “I’m invincible” factor, it is really difficult for a parent or doctor to convince them of the importance of safety. We live on a college campus and it is definitely the minority of students who ride to class wearing a helmet. Hopefully that will start to change. I’ve seen some colleges running bike safety classes and giving away helmets as part of orientation. Hopefully as more peers start to wear helmets, we’ll see a culture shift in this age group. Interesting NPR story! Thanks so much for reading and sharing your thoughts. The Ohio AAP is having bike helmet safety awareness week next week. We received free helmets for our office to give to kids in need. That’s just one part of initiative. This is great, Dr. Somsak! I’m involved with our local AAP chapter. I’m going to see if there is interest in doing something similar. Thanks so much. I’m a bike commuter and it really bugs me when I see grown ups biking with their kids and not wearing helmets. Helmet use seems to be pretty consistent with the little ones, but it’s so important for parents to model appropriate behavior. I don’t see a lot of teens on the bike trail at commuting times but helmet use seems to be fairly prevalent. I still remember going over my handlebars as a teen without a helmet. Luckily I didn’t land on my head. I used it pretty consistently after that. PS My older son had that same bike. He loved it. Wish I had gone straight to pedals without training wheels as he was ready. 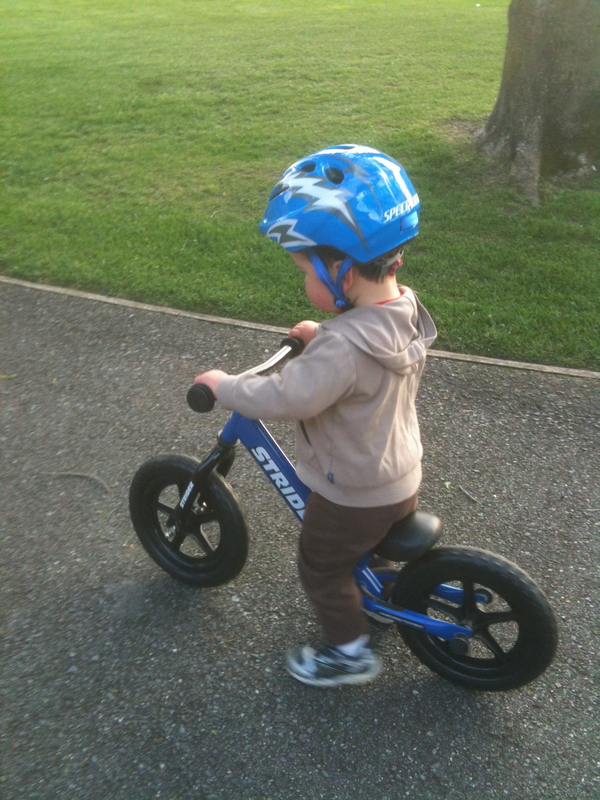 We’re liking the little pedal-less bike as well, although he’s just starting out and is still a little bit tentative. I’m amazed by some of the 3 and 4 year olds I see zooming around on these.